Where I live pecan pie is part of what makes us Southern, but you other folks, well you can be as good as us folk if you learn how to make pecan pie. I'll leave that poke salad recipe for your coming to visit in Cloutierville, but here's the pie recipe y'all been asking about. 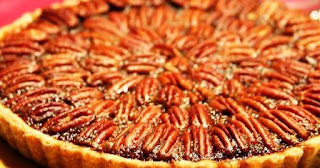 I make up my own pie crust for my pecan pie, but you can get it already done at the store, at least that’s what my uptown friends tell me. Me, I just figure it out with a pinch of this and a pinch of that. But here’s what you can try. Take some flour, maybe a couple cups, and some salt, just a wee bit, about 2/3 cup of butter and enough cold water to get it mixing good. I add a little vanilla flavor too, just a tad to make that crust all tasty like. Now stir that up, and then roll it out and put it in your pie pan and make sure them corners is smooth. Then bake it up for about 20 minutes, depends on your oven, but mine is old and takes time to warm up, so I just watch it until it gets just golden brown. Then I take it out when it’s ready, so I can put in that good pecan pie filling. In your bowl put in some pecans, a couple cups or maybe three, and mix them up with about ¾ cup of maple syrup and about a half cup of brown sugar. Add some melted butter to it, along with either more of that vanilla flavor or maple (my Leroy likes the maple stuff, but the rest of the family likes vanilla). Stir that up with a couple of eggs, and put it into that pie shell, and then into the oven for a little less than an hour at about 400 degrees, give or take. Me, I just check it after about 40 minutes or so, cause burning a pecan pie is a really sorry sin for a good Southern granny like me. Now Leroy is already in my kitchen, and he’s telling me I shouldn’t be sharing our family secrets. But you aren’t gonna get my poke salad recipe, cause that's the secret Granny will never tell.